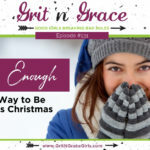 New to Grit 'n' Grace? Stop by our About page—there's a special gift waiting for you! It’s such a human habit to keep on doing what you’ve always done, hoping for different results. 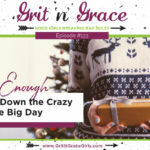 (It’s also been informally dubbed the definition of insanity…) In this episode, Amy and Cheri process what they learned while following through on their intentional pre-decisions to do things differently — during the holidays and during their spontaneous January sabbatical. The good news is that we aren’t trapped in our ruts. You have an open invitation from Jesus to leave your comfort zone for “a spacious place” with Him! In what familiar “place” have you stayed too long — just because it’s familiar? How can you respond to Jesus’ invitation for you to follow Him to “a spacious place”? Amy and Cheri took a one-month sabbatical from the podcast for rest and reflection. What might you take a sabbatical from … and for? There’s a loud echo in my head that says, I’m just not doing enough for God. I have been made fun of my whole life because I am too sensitive. It just feels like every decision I make is wrong. I wish I could just be myself. I am so tired, but I just can’t say no. Well, this is Cheri Gregory. And you’re listening to Grit ‘n’ Grace, good girls breaking bad rules. The podcast that equips you to lose who you’re not, love who you are, and live your one life well. If this is your first time listening in, this is a podcast for women who love Jesus and long for the abundant life he’s promised. But some days, maybe even most days, you feel kinda like a puppet with perfectionism and people-pleasing pulling your strings. If nothing you do ever seems good enough. If you try too hard to do too much for too many for too long with too little. If you exhaust yourself spending time to keep everyone else happy and your own needs go unmet. If you struggle with the C-word, control. We get it. And you’re in the right place, girlfriend. Because we have the best guests! We do! Women who come along side you, and equip you to replace the exhaustion of self-made goodness with the rest of God’s grace. Every week we kick culture’s bad rules to the curb, so that we can follow Jesus’ good plan for us. 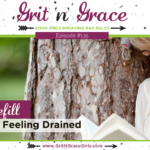 After you’ve listened to this episode, we’d love to have you join the conversation in our Facebook group. 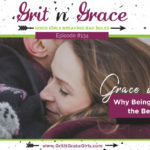 If you’re not a member yet, just search for Grit ‘n’ Grace girls, and you’ll find us. Today’s topic of conversation is processing our decision to say no in January. Hey, Cheri? Before we process, I have this little gift that I got from my son. It’s actually a no button. Would you like me to play a little of it for you? And they go on, and on, and on, and on. Oh my goodness. Have you seen the Tim Hawkins video? Of him talking about him about the gift of no? Giving his kids the gift of no? No. But I’m going to look for it, ’cause he cracks my whole head up. We will put a link … first of all, I want that button. And then, I want a recordable button. And I want all of my friends to record it so when I’m tempted to say yes, I hear your voice say no. I hear Kathy’s voice say no. I hear Daniel’s voice say no. I hear my kids voices say no. Can you imagine how valuable that would be? Oh that would be really great. A programmable no button. That’s what we need. I think this one can be found at Target, actually. So I want that one to begin with. But then, yes, I want a customizable one so if I’m wrestling with indecision, and I know should lean one way, but I’m so tempted by people-pleasing, I can just sit and push it and have all the people in my life say no in a row, and then I’ll have the courage to do it. Okay, but I do hear that there’s one particular no that you’d like to say, and it’s no to skunks. You know, some of our earliest listeners may remember Skunkaggedon, which was a couple of years ago, when, I don’t know, I think a whole herd of skunks, a passel of skunks? I don’t know what a group of skunks is called. But they detonated under the house a few days before a retreat, and I literally went to that retreat stinking of skunk. And I remember you saying, I’m glad we don’t have smell-a-vision. But that was your form of sympathizing with me. But horrible. I cannot imagine. Okay, so fill us in Cheri. So this was my January rest, okay? I was supposed to spend January resting. And, in the month of January, and it’s still January, ’cause we’re recording this on the last day. I can say as of this morning, and I will share a photo in the Facebook group, as of this morning, we have trapped six skunks that were under our house in some point in time. So we don’t have to use the explicit setting on this podcast, but can we let our listeners in on our little joke? Okay, Cheri has a skunk brothel under her house. I swear there’s a red light on top of our house. You know at first it was annoying. Of course it’s annoying the whole way through. But at some point, somewhere between skunks three and four the whole thing became ludicrous. Kathy said we need to stop throwing skunk chow under there. But I do, I think we’ve just got a bunch of little skunk pole dancers down there, and they’re just having a good ol’ time. They’re all named Roxanne, but we’re pretty sure if you would catch Pepe Le Pew, he’s running the joint. And so, we could shut the whole thing down. But I know I’m not the only person who’s having trouble with wildlife. I have skunk, you have the squirrel. Okay, we have a squirrel that is smarter than us, which is just disturbing. I’m talking about my squirrel on my Facebook page. He’s my squirrel. Like after my dog died, I named my squirrel, which my husband says is indicative of something deep and disturbing. It means that you love God’s creatures. Yes! Well his name is Brassy, ’cause he’s so bold. And he has loved our deck. Well last year we built a new deck because our old one was about to fall down. We built a new deck and a pergola. And Brassy has decided he wants to build his nest on top of our pergola. Our lovely spot. So literally for three weeks we’ve been battling this squirrel. Okay, so for you animal lovers out there, cause we’re animal lovers too, but hang on because this does have a happy ending. But Barry even bought a gun. It brought out the hunter-gatherer in him. And so the man went to Walmart and bought this kind of, I don’t know, this fancified, what do you call it? It’s like a little gun, it doesn’t really do anything. BB gun. Oh yeah. A fancified BB gun. He was gonna kill the squirrel. Well he never could hit the squirrel. But we’re all thankful. I’m sorry. I shouldn’t be, it tickled me. I can’t. I just can’t. But anyway, he never did hit the squirrel, but he did come up with, finally, an ingenious way to cap off this area that he was getting into. So we think we have beaten the squirrel. But we’ll give you updates, ’cause he has proven to be smarter than us up until this point. Well, and at one point you guys were eyeball-to-eyeball with him, right? Oh, he is so not afraid of us. Yes. I mean, he was sittin’ up in his little nest, looking down at us as we’re pulling all the stuff out. I cannot tell you, we’ve had piles of debris on our deck. Because he’s a very hard worker. He really is. He’s a perfectionist. He needs to chill out. But clearly not a people-pleaser. He needs more people-pleasing. Yes. Give him a little dose of that. Alright, well let’s talk a little bit about our holidays. ’cause we talked during our holiday series of things that we had in mind that we were planning to do, and for the sake of accountability, let’s talk about how that went. You had a plan to be un-offendable. Which for someone who’s an Enneagram 1, I am starting to understand, that was a huge goal. I mean, there’s like some personalities that are much more naturally un-offendable, but you’re kind of wired to be easily offended. Because you care so much about things being done well and right. So, share with all of us, how did that go? Well it went really well. And it went really well for one reason. And one reason only. ’cause I’ve made these kind of strong declarations before, and failed miserably to be quite honest. But the reason that it went so well is because Barry came to me, right before Christmas, and God had spoken something very similar to him. And I don’t think he used the word un-offendable. But we were going into a situation … we have a large family, and we were all together during Christmas. So just in that setting, we adore our family, and we love being with them. We have so much fun with them. But when you get that many … Barry says, too many fleas on one dog. I wish I was southern, just so I could have you guys’s expressions. That is so good. Keep going. But when you get that many people all in one place, there is just so much opportunity for being offended. At every little thing. And Barry just said, hey Amy, let’s do this together. It’s gonna be water off a duck’s back no matter what happens. And it was interesting that that actually worked. And I think it was a lot of different things. I think it was having Barry’s support in that. I think it was also having Barry in the room, and hearing the conversations I was having. So he would actually know if I was going over those lines or not. But I think probably the most powerful thing is the two of us sat, before Christmas, before we went on that trip, and we prayed. And I believe that we were given Divine Provision for being un-offendable. And you know what, Cheri? We were not offended. Okay, so you weren’t just white-knuckling it, and swallowing and stuffing, and then having an ulcer afterwards? I’m gonna challenge you. Because I am guessing that when you’ve made that declaration ahead of time, but tried to do it completely on your own, you’ve gone in with an attitude that says, don’t offend me, don’t offend me. I’m here to be un-offendable, and if you offend me then you’ll ruin everything for me. And, I think that brings something to a room, whereas, I’m willing to bet you and Barry brought a peace with you that made it hard for other people to be offensive, because you weren’t going to be offendable. And you may just not have been aware. We can’t really sense that til afterwards or if somebody else tells us about it. I’m willing to bet there was a distinct difference in you and Barry, and that changed the atmosphere of the situation. Which is exactly that you were describing, that I’ve kind of felt before. Like oh, I’ve gotta be on my best behavior, and white-knuckling it, as you said. I felt relaxed. And that was a divine gift. You just can’t generate that stuff yourself. So you had a Christmas miracle. Yes. It was a little Christmas miracle. But I understand you had one too. Oh my goodness, yes. You know one of the things I said we were going to do, and we did it exactly the way I had said, is we got together around the dining room table, the first weekend of Christmas break. Ann Marie was here for three full weeks. And, I handed Daniel a calendar and a pencil. And bless his heart, he’s not a big fan of scheduling things during vacations. He prefers spontaneity during vacations, and he also doesn’t like meetings. So that was a real sacrifice on his part to even hang out and be there for a official meeting. But we just went around and we brainstormed what movies do we wanna watch, what things do we wanna do. What’s gonna make this Christmas for us. And there was a wide variety of things. And Ann Marie and I went through the calendar. We just kind of penciled it in. And some of ’em were more like, somewhere in these two or three days we’d like to family photos. Ann Marie wanted to take family photos, but she had to wait for the weather to be right. So we had a span of three days. And, we all agreed, that as much as some people in this family hate photos, for one full hour they would be completely available and not make funny faces or be difficult, or snide remarks. And here’s the cool thing, everybody followed through. Everything that was on that list happened. Everybody showed up for it. And, we had a wonderful time. And I didn’t have the anxiety of, okay, somehow I’ve gotta find a way to convince people to do this today. And okay, now I’ve gotta make everybody pretend to be happy about this … like, we all knew what was going to happen, and we all, even if some of what was being done wasn’t some people’s favorite thing to do, we chose to show up and be present for whoever had wanted to do that thing. And, it was the best Christmas we ever had. And none of us got sick. There were no urgent care visits. There was no pneumonia, there was not bronchitis. Which for us is unusual. And then, then was something that for me was so important. The kids had been watching a program together in the evenings. And I like to work downstairs as well. And, it was loud. And they were on their laptops. And of course I love that they love to spend time together, and I didn’t want to shoo them upstairs. And the fire was such a nice place to be. But, I wasn’t getting work done. And it was just too much noise for me. I was getting sucked into it, and it was high drama, and so my HSP brain was like, late at night, I can’t go to sleep if I’ve been hearing all this kinda stuff. And so, one evening I simply said to them, you know that program that you’ve been watching? Hearing it isn’t working for me. Could you use earbuds? Or, just let me know ahead of time and I’ll leave the house. And, I didn’t explain anything. And there was a little concern about whether the earbuds would go far enough. And so I got a splitter so two pairs of earbuds could be hooked into the same splitter. And then Jonathan had an extension. And so next thing I know, they’re watching the show. They’re still laughing and chatting with each other, which I can totally handle. But I didn’t hear it. And they were doing it in the same place. In front of the fire. No discussion. No nothing. But, here’s the thing. They could’ve said no. They could’ve said, okay we’ll let you know when you can go leave the house. And I would’ve gone to a local library or Starbucks or something like that. Which would’ve been not my preference. But the important thing is, I actually, early on, I said, here’s what I need. And I didn’t try to defend myself. I didn’t try to guilt them. I just said, here’s what I need. Here’s two options. And then, I shut up and let there be silence. I spoke up, and didn’t wait until the end when I hadn’t gotten things done, and was resentful and bitter and upset. I said it early. And I did get an amazing result. But, the result is less important than the fact that I did it. Yeah, but the result … anytime that I’ve done a hard thing. Or moved past a place of comfort, and then the result is positive, the beauty of that is it’s reinforcing. And also the beauty of that is it proves your children are lovely people. And that they’re respectful people. Just the other day, and I can’t remember where I read it, I read a woman who said, for decades of my life, I have tried to prove that I am wantless and needless. And it was like, wow. And I think our culture really throws that at women a lot. Especially the whole motherhood thing, is like, you can’t have wants and needs because you have to meet your children’s wants and needs. And certainly, when they’re babies. That’s just reality. That’s not even a … that’s just reality. However, the older our children get, the more important it is that we express our wants and needs, because they need to become people who care about other people’s wants and needs. And yours obviously do, which is so lovely. And can I just throw in there, they cooked the entire Christmas dinner. They spent two full days in the kitchen. And it was amazing. They wouldn’t let me. I kept coming in and trying to help. And the literally would shoo me out. It was hysterical. I was not allowed to … I started to put my hands on the baklava, and my hands were taken off the baklava. And I was escorted out of my own kitchen. That’s amazing. I love that. Alright. So. Your goal for January was to take time off and spend it in reflection. So, tell us what you have been reflecting on, oh wise one. Well, I’ve already been reflecting on how hard it is to reflect. Because you see, it doesn’t feel like work. Number one. And, there’s nothing really to check off. Yeah, this is a problem. So obviously I have some work to do still. But, I did have something wonderful happen. God loves me. He understands me. So it was this little grid. The first page was the reflect, which was perfect. I knew that that was exactly for me. It was time to look back on 2018. And there was a series of ten questions to answer. And to think back on 2018. And Cheri, that was so amazing. Because the end of 2018, there has been, I don’t know how to say it except church drama. There’s been church drama. Which for those of us that church is a big part of our lives, and that’s really important, it’s really hard to have church drama. So, it had kind of colored the way that I saw the whole year. It was terrific for me to be able to go back and answer these questions and realize, 2018 was fabulous. Wow, that is so important. Just one thing, at the end of the year, didn’t ruin the whole year. So that was so good. And then the refocus, and I’ve been working on that, is making intentional goals for this next year. And some of ’em are so simple, Cheri. And what you just shared about Christmas really encourages me. Because I do tend to have these big dreams and these big goals, and then just not do them. But one of my goals this year, is I love being outside. I’m not really an outdoorsy camping kind of girl, but I just love being … don’t laugh. I love being outside. So one of my goals is once a month go do a new trail in Wake County. So I looked up on the internet, and they have the top ten trails in Wake County, and I thought, okay. I’ve got my resource right here, I just need to put it on the calendar. When can Barry and I go do these trails. That’s just one example of one of the goals that I made. Some of them were professional. Some of them were personal. And then, some of them had to have a little fun in life, which is important. I love it. And, when you’re walking those trails I’m betting there’s gonna be some reflection going on. Because you can’t possibly be out in nature, and moving your body in healthy ways, without having some good reflective … at least to me that’s where the Holy Spirit often shows up and says, hey, here’s something new, ’cause your mind is available to it. Now, I know rest was a real challenge for you in January. In our Christmas episodes, some of them, I did mention that Rafiki was diagnosed with diabetes. Well, treating him in December and January meant a lot of glucose testing. If you look at his charts you can get an idea of how much I did or didn’t sleep. And for quite some time there I was also afraid he was just going to die on us, that I had a hard time sleeping at 2:37 in the morning. The bottom line right now, as of today, is that we think we found a management protocol that is working. I’ve actually gotten a few good nights sleep. Last week I traveled to Hawaii for a retreat. Suffering for Jesus, I know girls. I’m really sorry. Right there on the sandy beaches. Somebody has to do it. But, I was gone for four days. Somebody else came in. We hired a former student to come in and do his testing, and his shots, ’cause my men-folk don’t do needles. But, for five days that I was traveling I was able to get full nights of sleep. And it felt so amazingly good. I thought it was going to be a month of lots of sleep, and downtime, and sweet communion with Jesus. And what it ended up really being was me fighting once again to release control. Because the whole little diabetes, am I doing the right amount of insulin? Should I feed him? Should I not feed him? And I won’t go down the rabbit-hole of all of that, but it was a long fifty days of trying to figure things out and get up to speed on it. I am at the end of January exhausted. When I was supposed to be rested. But, God has shown me so much again about areas in which I can spiral out of control so quickly. I am physically tired, but I know that he’s sustaining me. And I am so grateful for the last few nights, I’ve gotten solid sleep. And I’m also just feeling how much I’m relaxing now. And realizing okay. And for those of you who aren’t cat fans, if you’re like, Cheri is insane for worrying so much. I get it. I get it. We all have our own things that we all do, or don’t dial into that heavily. Okay, we can stay friends. -to keep Rafiki in a good place. I will post a video of him purring, because it really is rather unbelievable. But here’s one thing that Daniel has instituted this month that has been helpful. And that is, we’ve started just hanging out together when he gets off work. And doing it predictably at 5:00. And just kind of chilling. And what I find myself doing is even though I’m not getting this perfect night of sleep, I’m still kind of tired, because of all that other stuff happening, what I found myself doing is I’d be working away, and I’d suddenly realize, in fact I was starting to set the timer on my cell phone, that it was 4:30, which meant Daniel would be home in about a half an hour. And so I’d start winding down. I’d start putting my things away, wrapping up my work. That’s what I’m supposed to have been doing all my life, but that’s not tended to be our habit. We tended to have a much more chaotic, unpredictable schedule. And this is now becoming something that’s the norm. And it has been wonderful to just dial down my brain, and realize my work day is coming to an end, and now my evening of rest and restoration, and recreation, and reconnecting with my family is coming. And so even though I’m still physically tired, something new has been brought in that is rest-related that is working. It is working really well for both of us. And that’s been awfully nice. Well, that’s terrific. That’s really great advice. Because for those of us that work at home particularly, I think because our home is also our workplace, work can really just spread into everything. And there’s gotta be a way to step away from that. So that’s a good rest practice Cheri. That’s awesome. Yeah, it was unexpected. 5:00, hang out with my husband. I thought rest was going to be more sleep, and it turned out to be something else. It’s something distinct that is happening. And we’re gonna keep it happening. So I am learning. I am learning more about rest, even though it’s showing up in a slightly unexpected way. So what’s the scripture that you’ve pulled for this particular episode? Well, I chose one that I know you love. It’s Psalm 18:19, that says: He brought me out into a spacious place. He rescued me because he delighted in me. You know that’s my life-verse. I love it so much. “We’re following Jesus into a new space.” And the space that he describes is so beautiful. It’s a spacious place. And it’s a rescue from where we were. Oh, I love that. I love that so much. So the grace in that for me is accepting that I need rescue. That’s not easy for a perfectionist or a people-pleaser, ’cause we’re the rescuers. And we’re the ones who do everything right in the first place. Exactly. Exactly. I have to really say, look at, and I’ve been reflecting on these things, the space, or the habits, the routines that I’ve carved out into this sacred thing. And said, okay Jesus, rescue me where I need rescue. And then for me, the grit is looking, or even imagining that spacious place, ’cause it’s new and it’s different. And it’s unfamiliar. And it’s way outta my control. And it’s kind of risky. So the grit for me is saying yes, I’m just gonna follow where God leads. And I know that’s what I should be doing all along. And I like to talk about that. And then, my habit is to do my own thing. So the grit is surrender. I guess it comes back to that word. The cure for the c-word is the s-word. The cure for control, is surrender. And that’s always gonna take grit for us Grit ‘n’ Grace girls. 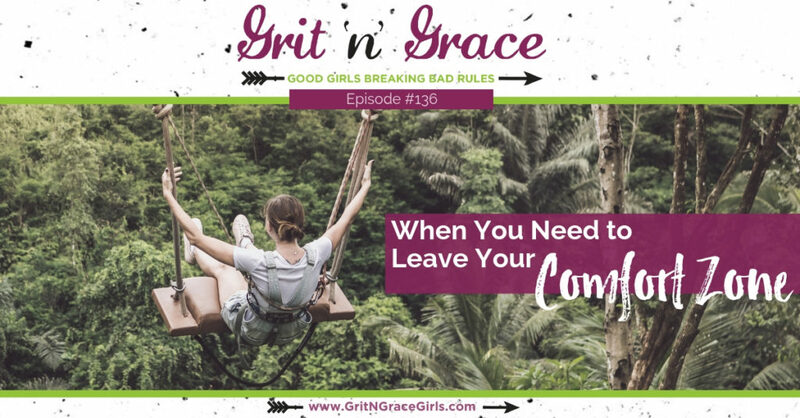 We hope you’ve enjoyed Episode 136 of Grit ‘n’ Grace, good girls breaking bad rules. 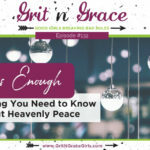 Make sure that you head on over to gritngracegirls.com\episode136, where you’ll find our digging deeper download, a principal resource that helps you apply what learned today, our show notes including the links to the resources we mentioned, and the transcript. We would so appreciate it if you could take just a few minutes to leave us a review on iTunes. You’ll find a link that’ll lead you to the review site on the webpage for this episode. Make sure to join us next week for our interview with Suzie Eller, author of The Spirit-led Heart: Living a Life of Faith and Love Without Borders. Yay! I will edit that and get it out. Today is the last day in January, and at this point in January, we’ve had either as many or more downloads as we had in November or in December. That’s great! That is great. So we were not abandoned. Leave your comfort zone for a spacious place with Jesus.